Oakland City Hall is located at One Frank H, Ogawa Plaza, Oakland, CA 94612; phone: 510-238-3612. Photo: Cameron-Stanford House, ca. 1876, 1426 Lakeside Dr, Oakland, CA. Listed on the National Register of Historic Places in 1972. Photographed by User:Sanfranman59 (own work), 2009, cc-by-2.5 (creativecommons.org/licenses/by/2.5)], via Wikimedia Commons, accessed August, 2013. The first white men to see what is now Oakland were Spaniards — Lieutenant Fages and Father Crespi, who headed an expedition in 1772. The expedition pushed as far north as Antioch, and active developments took place across the Bay, but it was nearly half a century before the site of Oakland was colonized. Cavalry Sergeant Luis Maria Peralta, as a worthy soldier of the royal Spanish army, received title in 1820 to a 48,000-acre domain, named it Rancho San Antonio, added "Don" to his name, and lived as befitted a gentleman of leisure. His grant included the entire East Bay area. For twenty years Rancho San Antonio played an important part in the commercial, religious, and social life of California. In 1842, the sergeant divided the ranch among his four sons, and Vincente Peralta was given the area where Oakland now stands. They owned great herds of cattle, maintained a large retinue of vaqueros (cowboys), and pursued the Spanish life of "fiesta and siesta." The American victory over Mexico in 1848 ended the era of the Spanish landowner in California, and the discovery of gold in the same year hastened the route. Mobs of gold seekers came to the flourishing town of San Francisco, many of whom tramped to the diggings through the Peralta holdings. Some of them visualized greater riches from these acres than from the Mother Lode. They squatted on the rancho, built shacks and fences, and ran off cattle, and resisted every effort of the owners to evict them. Moses Chase, however, who came to Oakland in 1849, was of a more ethical turn of mind. He became associated with the three Patten brothers in a lease of 460 acres from Antonio Peralta. They were the first farmers of the district, raising good crops of grain and hay. The early town of Clinton took form on their acreage. The Patten brothers soon entered the lumbering business in the Peralta Redwoods, a stand of giant trees that extended from the top of the range midway to the Oakland estuary. In the middle 1850's more than 400 men were employed in the mills, cutting lumber for the building of San Francisco, Oakland and their environs. In 1851, the Rancho San Antonio was well spotted with squatters and purchasers, and in that year there appeared a man who gave the Latin owners, and the Americanos, a lesson in plain and fancy financing. Horace W. Carpentier had a degree from an eastern university, a keen sense of values, and more than one man's share of vision. 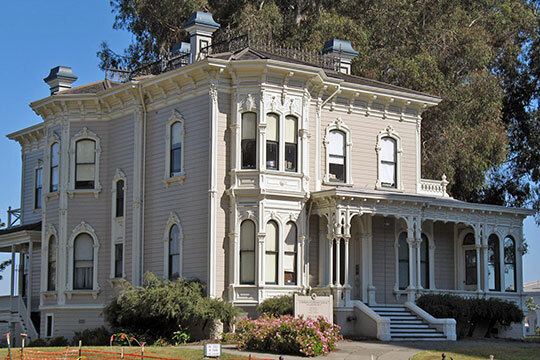 He acquired a townsite in the present downtown Oakland, imported a few "residents" from the redwoods, and in 1852 incorporated the Town of Oakland, with himself in the mayor's chair. The name he selected from the numerous stands of encinas (evergreen oaks) that dotted the landscape. Two years later Mr. Carpentier incorporated the town as a city, and by that time had acquired the entire Oakland waterfront in exchange for building three tiny wharves and a frame schoolhouse. Thus began the "battle of the waterfront," which was terminated in 1910 when the assigns of Carpentier agreed with the city to waive title to their properties in exchange for long term leases. The first ferry across the bay began operating in 1850; first train chugged through Oakland in 1863; and overland service was established in 1869. In 1906, when San Francisco fell victim to earthquake and fire, 50,000 refugees moved to Oakland. There was a building boom to provide housing for refugees who became permanent East Bay residents. The city annexed all hamlets and towns to the southeast and in 1907 the population reached 147,000. The industrial stimulation that followed this influx moved Oakland into third place among California manufacturing cities as early as 1910, and by 1920 its population increased to 216,000. During the World War four large shipbuilding plants were operating under forced draft, and following that period the city production increased in automobiles, lumber and allied products, electrical machinery, canning, and cereal products. The aggregate value of Oakland's industrial output was multiplied five times between 1914 and 1927. In 1936, Oakland celebrated with San Francisco the opening of the San Francisco-Oakland Bay Bridge.